Promising galloper King Cougar delivered an emphatic statement to those who questioned his credentials on firmer ground when he stormed to victory on his home turf on Saturday. The Awapuni local has fashioned a more than useful record to date on mainly wet tracks with four wins and three placings from just nine starts. His only failure came when he finished last at Otaki in December on a Good3 rated surface which had some pundits questioning whether he was as effective on better going. Although successful on a Slow9 track at Riccarton last month, trainer Mike Breslin believed his charge had strengthened further since then and would prove highly competitive in Saturday’s rating 82 6 f event that was contested on a rapidly improving Slow7 surface. Handled confidently by Johnathan Parkes, King Cougar stalked pacemakers Gift Of Power and Manhattan Street throughout before bursting to the lead with 1 f to run. Gift Of Power rallied gamely but King Cougar had momentum on his side as he fought off her challenge to nail a telling victory. “His work has been super and I was half-pie expecting what he did today, although against one like Gift Of Power you never quite know. Breslin believes that the patient approach he has adopted with the Alamosa five-year-old will reap plenty of benefits in the future although he does have in mind a greater challenge for his charge as early as next month. 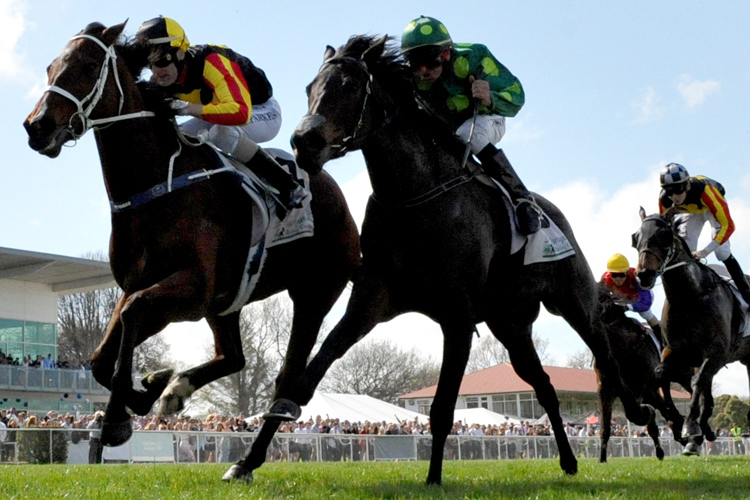 That race is the Gr.3 Red Badge Spring Sprint (1400m) at Hastings on October 6 which is the one of the feature events on the last day of the Hawkes Bay Spring Carnival.